(WWMD) What Would Mary Do? Good morning, this is May 1, 2013 and my heart is OVERFLOWING! Yesterday evening I enjoyed sweet fellowship with like believers from our current congregation. As we were sharing about the goodness of the Lord I felt to share the scripture that God gave me for 2013. Each morning as I come to work I see this scripture posted on my board to the left of my computer screen. I cannot tell you how many times I read it a day – but it is in my mind and heart continually. Like many of you, I have a promise. Not just any promise, but a promise that God spoke to my heart when I was just 16 years old and I believe Him with all my being. Though many years have passed, our children are now out of the house, and we have struck out on the journey of faith in ministry while living a life of incarceration – I know that my God does not lie! As we were each sharing about God’s goodness – the question arose: “What happens when God tells you something before He tells your husband? What do you do?” Wow we went from sharing to a serious question that many couples struggle with – both husbands and wives. Mary was visited by an angel who told her of things to come – where she immediately responded: YES LORD! She shared this information with Joseph (her intended) who did not believe her and was going to privately break it off between them. An angel then revealed to Joseph that what Mary had experienced was true, then gave him instructions to go through with the marriage ceremony and the name for God’s own Son. After that we never see God or an angel speaking with Mary again – always her husband Joseph and much later her adult son Jesus. God is about order, He shares things with his children equally, but He expects us to follow His instructions about how to carry out His vision. God → husband → wife → children. By the time I got home, more revelation came to me as I began to comb the scriptures. God spoke to Mary first, He then gave her confirmation through her cousin Elizabeth. Joseph first doubted Mary’s word – God spoke to him and confirmed His plan. Angels came and bore witness to the shepherds in the field (people who did not know Mary and Joseph) and they came to share what the Lord had said. People in the town of Bethlehem wondered at the words of the shepherds, many doubted the Word of the Lord. Three Wise men came (Gentiles) to bring gifts to Jesus and worship Him, as God had guided their hearts. What I noted is that even though Mary, a woman that God hand-picked to bring His Only Son into the earth had a personal encounter with God – she submitted to the leading of Joseph. Yes, I used the “S” word. I said it – SUBMISSION. Oh you thought we were going to talk about Mary (the mother of Jesus) and how she was a Warrior Bride? We are! She is the example that God shared with me yesterday evening so I am compelled to share with you! Mary loved God FEARLESSLY, she is our example of a true Warrior Bride! She knew what God said. She shared God’s plan with her beloved. She waited for God to confirm her words to her beloved (this is where most of us fall down / or buck like a wild broken to do it “God’s way”). She walked in submission to her earthly husband Joseph. She moved when he said move (while in her last trimester of pregnancy and again when Jesus was still a toddler). She took care of the house. She took care of their children. She took care of her husband. She trusted God enough, to allow Him to be God and handle the “details” of her life! I know, I know it is 2013 and you believe that there is no way that God wants you to live a life like that. Mary lived pre-USA, things were different back then. We have equal rights here in the good ‘ole USA, we are liberated women and doesn’t the Bible say that we are neither male nor female in His Kingdom? We are New Testament believers! Let’s look into The Word of God and see what He says? Galatians 3:27-29 (NLT) 27 And all who have been united with Christ in baptism have put on Christ, like putting on new clothes. 28 There is no longer Jew or Gentile, slave or free, male and female. For you are all one in Christ Jesus. 29 And now that you belong to Christ, you are the true children of Abraham. You are his heirs, and God’s promise to Abraham belongs to you. Yep, it says that we are united with Christ alright, but let’s see what else the Lord says about us women, specifically wives. Wow, straight out of the gate God said that He knows we want to control our husbands but this is not His desire for us. Ephesians 5:21-26 (NLT) 21 And further, submit to one another out of reverence for Christ. 22 For wives, this means submit to your husbands as to the Lord. 23 For a husband is the head of his wife as Christ is the head of the church. He is the Savior of his body, the church. 24 As the church submits to Christ, so you wives should submit to your husbands in everything. 25 For husbands, this means love your wives, just as Christ loved the church. He gave up his life for her 26 to make her holy and clean, washed by the cleansing of God’s word. Colossians 3:17-19 (NLT) 17 And whatever you do or say, do it as a representative of the Lord Jesus, giving thanks through him to God the Father.18Wives, submit to your husbands, as is fitting for those who belong to the Lord.19 Husbands, love your wives and never treat them harshly. Let’s go back to Mary. Did Joseph believe her? NO, he did not. Do we see Mary proceeding with a “discussion” with Joseph? Do we see Mary dragging Joseph down to the local synagogue and having the priest bust out the scrolls and read from the book of Isaiah or Daniel any other passage in her defense? We see no record of Mary doing anything but saying Yes to God, sharing the news with her intended and her cousin Elizabeth and God did the rest. Because Mary was submitted to God’s love for her, she loved HIM without fear, trusting that HE would take care of the details that could hinder what HE promised. Not convinced? Let’s check out the Word of God for us disciples of Jesus and what He says our behavior should be when we have received revelation but our husbands have not. I Corinthians 7:12-17 (NLT) 12 Now, I will speak to the rest of you, though I do not have a direct command from the Lord. If a Christian man has a wife who is not a believer and she is willing to continue living with him, he must not leave her. 13 And if a Christian woman has a husband who is not a believer and he is willing to continue living with her, she must not leave him. 14 For the Christian wife brings holiness to her marriage, and the Christian husband brings holiness to his marriage. Otherwise, your children would not be holy, but now they are holy. 15 (But if the husband or wife who isn’t a believer insists on leaving, let them go. In such cases the Christian husband or wife is no longer bound to the other, for God has called you to live in peace.) 16 Don’t you wives realize that your husbands might be saved because of you? And don’t you husbands realize that your wives might be saved because of you? 17 Each of you should continue to live in whatever situation the Lord has placed you, and remain as you were when God first called you. This is my rule for all the churches. Now these scripture passages are talking about families that are unequally yoked. Today just like in the days of the Bible – there is more than one type of unequally yoked marriage. A couple who is married and one has had a deeper revelation from God in their life than the other. What is fantastic about God? He knows about every situation we women have walked through and will walk through here on the earth that He created! When we trust in God with our all, when we submit fully to God’s love for us – we don’t need to defend, shout, or argue about God’s Word/Revelation to us. 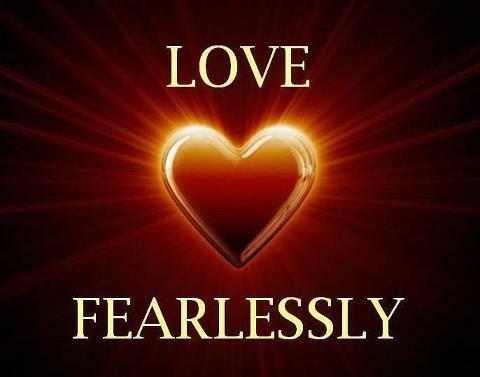 This entry was posted in Faith, Love and tagged fearless love, God's love, Prison Wife, submission. Bookmark the permalink. 1 Response to (WWMD) What Would Mary Do?